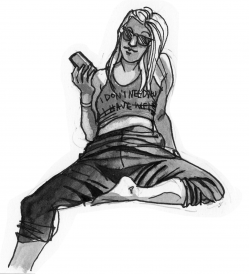 Ask the Femme: My girlfriend would rather check her phone than talk to me! I’ve been with my girlfriend for a year and a half. We moved in together a few months ago and for the most part, things have been fine. My biggest problem is that whenever we have ‘down time’ after school for her (she’s still a student) and after work for me, she just zones out on her phone. Before we lived together she never did that. It’s really annoying. I don’t think she’s cheating on me or whatever. I just don’t like it. I feel like we talked more before we lived together. She will even do it when we go out to eat, which isn’t often because she’s a broke student and I have to support both of us. I feel like she’s ignoring me. Maybe not ignoring me completely, but like, I don’t keep her entertained enough or I’m boring or something. Does this happen to all couples who move in together? What should I do? Thanks for writing in! I totally get your frustration. Sometimes I look at groups of people who are all out to dinner and mindlessly scrolling through their phones and I’m like, “Stop! Enjoy each other’s company!” But I am also totally guilty of it too. Sometimes my fiancé and I will both be on our phones while we are out to dinner and become “that couple.” It happens to the best of us. I think that you should talk to your girlfriend about it. From your letter, you don’t mention talking to her about this at all. Instead you are letting yourself spiral downward when there might not actually be a problem. When in doubt, talk it out! Tell her that you are starting to feel insecure about yourself because of all the time she spends staring at her phone. Some people have more addictive personalities than others and she might not even realize how many hours she is wasting on it. She might even thank you for pointing it out. The next thing you should do, after you talk about it, is to ask that date nights be phone free nights. I can sense some resentment on your part about paying for dates that your gf doesn’t seem to appreciate in the way you want her too. You need to nip this in the bud now before it becomes an actual problem in your relationship. Just because you are paying for the date, doesn’t entitle you to anything from her. You chose to merge households and expenses in this relationship knowing your gf was a broke student and that there would be an imbalance in bill paying until she graduates and can contribute more. So leave the issue of who pays for what out of this conversation. Good luck, Ignored! I’m sure you and your gf will be back on track in no time! For more illustrations by Lee Ely, visit their Behance page or buy a print from Society 6. The illustration used on this page was based on a photo found on What Japan is Wearing. Posted December 14th, 2015 & filed under Blogs, Dating, Love. Long distance love: Can you make it work?